I'm thinking her weekly redecorating routine is one of many reasons Jesus has to stay on his toes with her :) And if Shirley didn't get the song from Grandma, she definitely got the shippy. Super blog Anna. Both ladies are icons . Staying warm on this side of the world. Thanks, Aunt Jody - So glad you're warm! Maybe you need to introduce the Cambodians to the "Animal Crackers" song if they haven't heard it yet. I bet they'd love it. Miss you!! how wonderful to have such nice memories of your grandmother. Mine was not so nice, which is why I love being a grandmother, the kind I didn't have. shippy and all. lol. And I'm grateful that my girl was not interested in the loom...funny story. So glad you are enjoying being a grandmother, Debbi - indeed, giving your grandchildren a grandmother who loves on them and makes "shippy" faces to make them giggle is a beautiful way to change the tragectory of your family, as well as to make ease a little of the rawness of your own memories of a not-nice grandmother. And I'd love to hear the loom story someday - I love funny stories! Thanks, Debbi! Congrats on having your ECE accepted! That is huge. And I think I have every line of "The Little Princess" memorized. What fun memories you shared. Shirley will be missed. She will be missed, Drema. You're right. And it's so fun to know you too were a "Little Princess" lover. Amazing how things like that connect people. Your loom troubles made me laugh. I've had similar children's contraptions from the bad place. One of the worst was the bazillion beads they're supposed to make into a picture then melt in the oven or with an iron. Seriously? Those horrible beads quietly sneaked into a super secret location. After I'd swept them up yet again. 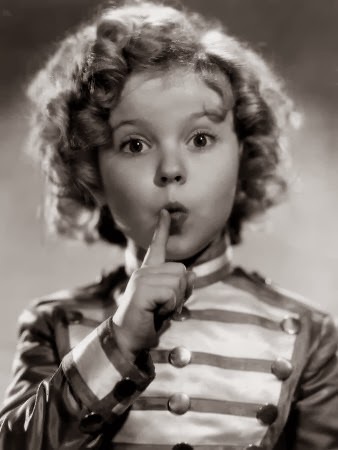 I'm ducking rotten tomatoes, but I never watched Shirley Temple as a child. My parents were mean and we didn't have a tv. Haha! I've used those Brazilian beads that you iron and my kids still make stuff out of them, but since I did them as a kid I at least had working knowledge of what to do. Of course, after awhile they disappear until I stop stepping on all those little rascals lost amongst the dust bunnies rolling around on the floor. And I highly recommend you at least watch The Little Princess with Shirley in it. You'd like it, especially now that you have a TV :) Have a great day, Danni!! Thank you, Jen! It's delightful to have you stop by! I know that life is so demanding and time short, so I appreciate you taking the time to say hello! Have a fabulous week!